Oslob Whale Shark Snorkeling + Malabuyoc Hot Spring + Kawasan Falls South Cebu Adventure Tour 1. South Cebu Adventure Tour 1. Whale Sharks snorkeling + Malabuyoc Hot Spring swimming and trekking+Kawasan Falls Swimming- Inclusions: Round trip transfers by car, snorkel sets, rash guards , breakfast…. The South East of Cebu is now famous as the site of whale sharks sanctuary in Tanawan, Oslob. It’s 140 km. away from Maribago, Mactan, with 3-4 hours travel by car. Whale Sharks visibility in Oslob was noted with a school of 22 recently, August 2016, but last June 2013 schools of 40 were visible in the area including the one which has a Tag in its tail as Baha, California, USA registered. Whale sharks are visible during good weather and clear water before the water temperature goes up, but when the water is rough and muddy, the sharks are not coming for feeding. Swimming with the whale sharks is so amazing and there are rules implemented by the government as follows; not approach near than 5 meters, use camera without flash, feeding is not allowed, application of body lotion is prohibited, etc. Recommended time of whale sharks watching and encounter is for 6-9am, after which chances of viewing is very slim. Oslob Whale Shark Sanctuary services includes boat ride with 2 – 3 crews as guide and watchers with 45 minutes per session per group. 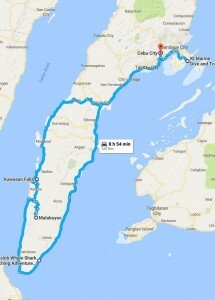 ＊ Pickup at 3:30am for Mactan Island Area, 4:00am for Cebu and Mandaue City Area. ＊ Arrival at Oslob at 6:30 to 7:00am. Take breakfast at Oslob beach resort. ＊ Around 8-30am depart to Malabuyoc with 1:15 minutes travel by car, trekking and swimming on the hot springs and take lunch. Depart to Badian with 45 minutes travel by car for the Kawasan Falls. Take 20 minutes trekking to the Falls, swimming and enjoying the cold spring. Depart in Badian at around 3-4pm with arrival at you hotel at around 7pm. ＊Inclusions: Round trip transfers by car, snorkel sets, rash guards , breakfast ( sandwich, coffee or tea ),juice, lunch, snacks, drinks, government fees , entrance fees, life vest, towels and shower. Note: Rafting fee in Kawasan Falls is not included.